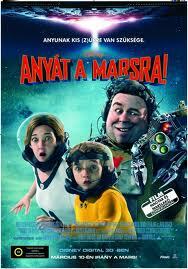 Mars Needs Moms Movie 3D becerita about a little boy named Milo. Where for Milo (Seth Green), her mother is the most annoying person in the world. Milo was no longer able to live with any rules made ​​by the mother. Throw away trash, must eat vegetables and many more rules according to Milo's not important. But as they say, things sometimes seem worthwhile until we no longer have it. Unbeknownst to Milo, it turns out there are beings from the planet Mars that actually require a mother and Milo's mother intends to take in order to care for their children. Milo instantly panicked. He must save his mother. He did not know how but importantly he must find his mother and rescued from the extraterrestrial. Obviously the business was not an easy business. Fortunately Milo himself.